Posted June 10, 2007 in 2007/06, 7 Freelance, Featured Work, Ghosting, Harvey, Periods, Topic, z Archive. A relationship starts between two high school students, Tom and Linda. Apparently Tom’s interest in Linda was not too strong because he begins seeing another girl, Ellen. 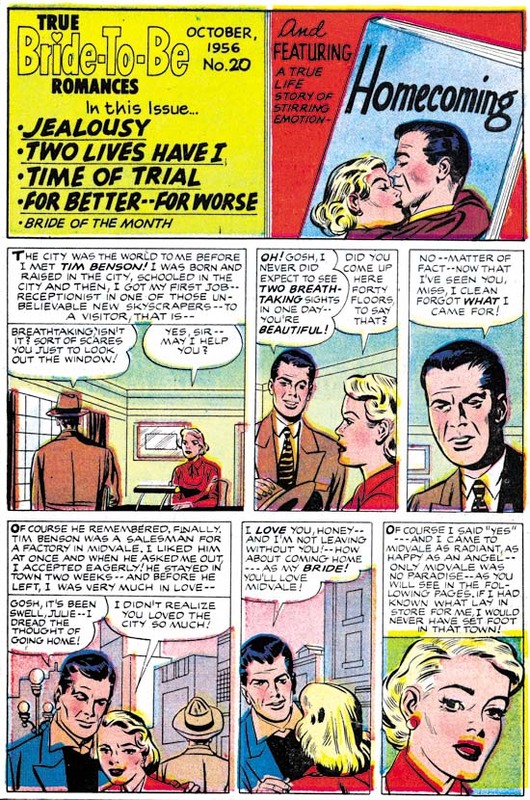 Linda finds out about this and in an article for the school’s newspaper reports about her relationship with and love of Tom. When Ellen reads and finds that she has unknowingly come between the two, she breaks off with Tom. Tom confronts Linda and declares his love of Ellen. Realizing that Tom and Linda are meant for each other, Linda regrets what she has done. Tom and Linda go off to find Ellen and after a long search find her at the edge of a cliff. Distraught about breaking with Tom, Ellen has decided she cannot go on. Linda calls out to she regrets what she has done and Tom only loves her (Ellen). The couple re-unite for a happy ending. This has got to be about the worse love story I have ever read. Histrionics rules all. It is bad enough that everyone’s emotions are overblown, they seem to switch to the complete opposite at a moments notice. The thing is I can imagine a young girl might actually enjoy reading this story. But for an adult male reading it fifty years later it is just painful. It is so bad that not even Bob Powell’s art can save it. It seems that the harder Jack tries to imitate another artist, the more his own personal touches disappear. Not just the expected facial features but his layouts as well. Well for the contents of HSR #55 Jack hardly tried to imitate Bob Powell at all. That explains why this shows the most Kirby traits of any of the contents that I have examined so far. It is certainly the most interesting of the introduction stories. Not only is the art rather nice but the script is pretty good as well. I suspect that Jack added his own input to the writing, the exchange in the last panel seems pure Kirby to me. Posted May 26, 2007 in 2007/05, 7 Freelance, Featured Work, Ghosting, Harvey, Kirby Or Not, Periods, Topic, z Archive. I got more of a response from my query about whether to continue posting on Kirby’s “ghosting” then I expected. Let me be frank, these are probably the poorest examples of Kirby art that you are likely to find. Because Kirby was imitating another artist he would give up much of what we admire about his artistry. At the same time Jack just was not very successful at adopting the other artist’s style. The shortness of the pieces and their marginal nature does not help much either. Although they are not great works of art, I still find them fascinating. It is interesting to see what Jack would keep, what he would let go, and what he would try to adapt. Anyway my game plan is to do a couple posts each of Kirby imitating two other artists. Also an example which I believe is Joe Simon doing the ghosting. Then perhaps a more casual examination of some other content pages. Newlyweds start their life in a small town. Originally the wife as a city girl and she finds life in a small town difficult. She struggles as best she can but the feeling of isolation takes its toll. Just as she decides to return to her family in the city things make a turn for the better. People, including her husband, begin to realize how difficult it has been for her and start to provide support. 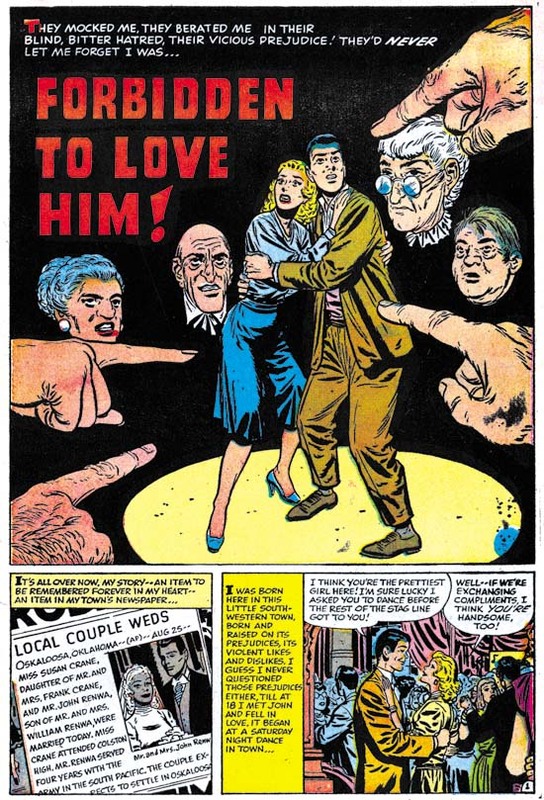 A very different splash by John Prentice then the last one I reviewed (First Love #70). But still a real nice design and a great segue into the story. Once again Prentice leaves out a normal panel boarder. But this time he also leaves out some of the background as well, in particular the walls. Not all of it is eliminated, we can still see a view of the outside through the open door. Not much there, just a picket fence, a small house and some trees. (And this time picket fence does not refer to an inking technique). Just this simple view is all what we need to place the story in some small town. The man carrying the woman over the threshold is pretty much completes the visual introduction. This content pages follows the most common pattern, a splash panel (in this case not much bigger then the rest of the panels) and a short introduction for the feature story. 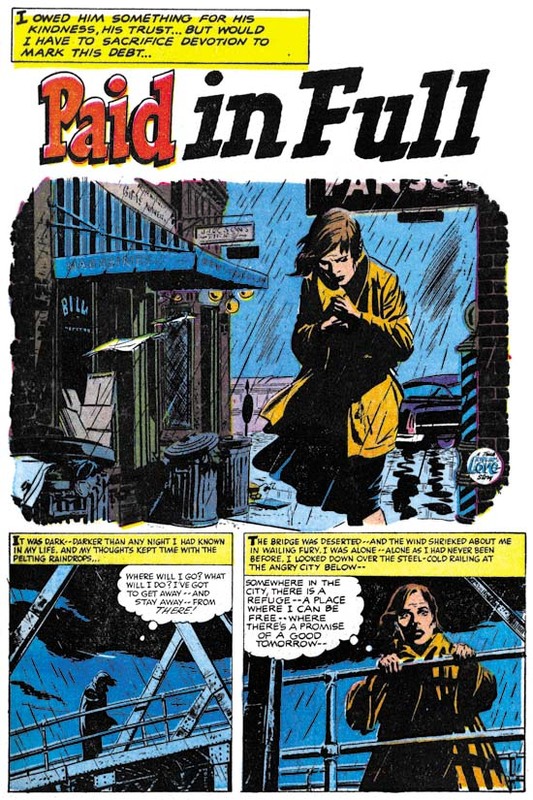 The splash panel is a close copy of from the third panel of the first page. Well in this case close means without much change in the posture. That hardly means that it is a good enough copy to really look like a Prentice. Still the woman is closer to John’s version then found in the introduction story. The splash does not provide much to go on but it does not look like Kirby’s work. The inking does not look like Jack’s either but it could be by Joe Simon. Because of that and in view of previous examples of contents, I am going to attribute the splash to Joe. The introduction is once more a prelude to the feature story. Showing how the couple met and fell in love. Yeah it really is superfluous but at least it does not spoil the story much. Ignore superficial traits such as eyebrows we can see some typical Kirby poses and layouts. Also some typical Kirby rendition of architecture. 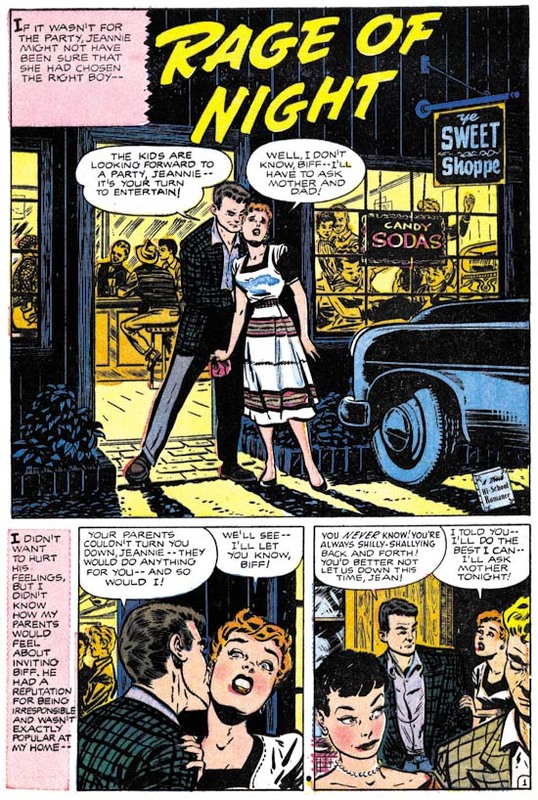 Jack even uses a similar architectural drawing style for penciling the interiors. I feel confident that this is Kirby “ghosting” for Prentice. But it is another not so good imitation. This time Jack does the best job on the man’s eyes. Eyebrows are not so well copied but at least they are closer to art by Prentice then they are to that by Bill Draut. The woman still has Jack’s preference for a triangular face with widely separated eyes. Not at all the longer, more oval face and closer eyes that Prentice preferred. Posted May 19, 2007 in 2007/05, 7 Freelance, Featured Work, Ghosting, Harvey, Kirby Or Not, Periods, Topic, z Archive. It is a dark and stormy night that we find our heroine. Alone and unsure as to what to do or where to go, she still is determine not return home. Looking out from a bridge (no mention of suicide but you got to wonder if that was the suggestion) a policeman confronts her. Rather then taking her in (as a vagrant?) he takes her to a boarding house run by an elderly lady. With the help of the cop and the landlady, our heroine begins a new life. A romance begins with the policeman. The lady is unsure about revealing her past to her love. However the cop has such high standards that she decides to keep it a secret. What this secret actual consists of is finally revealed when her brother suddenly appears. The brother is a criminal and is on the lam from the law. It was the discovery of that fact that originally led our heroine to leave home. 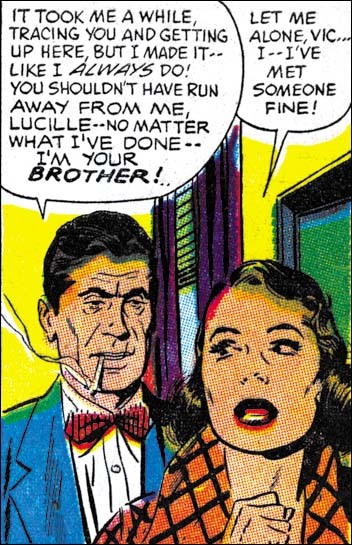 The lady finally reveals her past to the policeman, but not about the actual presence of her brother. He is outraged because she is not the good person he thought she was. He breaks off there relationship. Later he has second thoughts and goes to her home. The brother pulls a gun but the lady prevents its use. A fight ensues between the criminal and the cop, which of course the cop wins. Afterwards the cop expresses his regrets and asks forgiveness, which the lady gives. As usual, Prentice did an outstanding job on the art for this story. 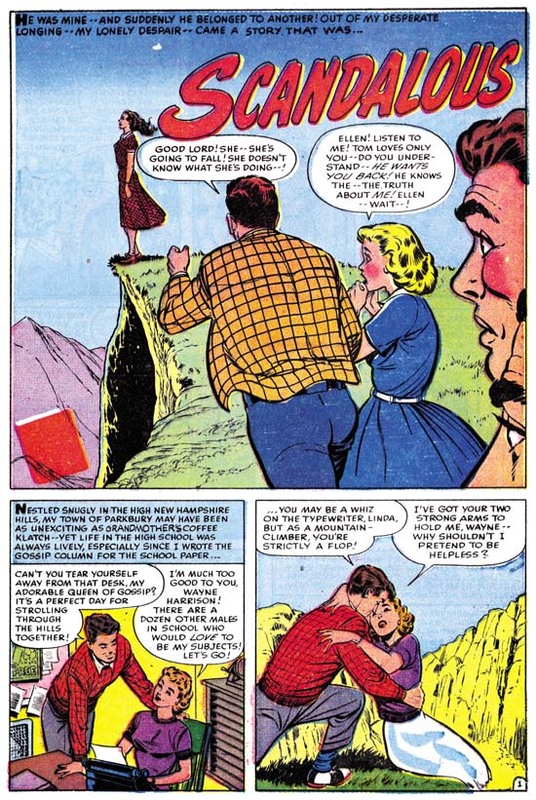 Particularly nice is his handling of the start of the story. The woman is alone, at the mercy of her inhospitable environment. A good visual presentation of her inner turmoil and despair as describe by the writer. The splash panel starts it off just right by rejecting a normal panel border and instead providing an rough edge to the art. John had a more realistic approach then most comic book artists. As seen in this example, John did not depend on that naturalism alone. He had a good sense of design and story telling as well. The content page for FL #70 follows the same sort of pattern I posted about for FL #68 and FL #69. That is Jack Kirby providing a short story introduction to the comic’s feature story. As before Kirby is purposely imitating the feature artist. For FL #70 the introduction story is quite short, only three panels. Therefore there is less to go on for the correct attribution. 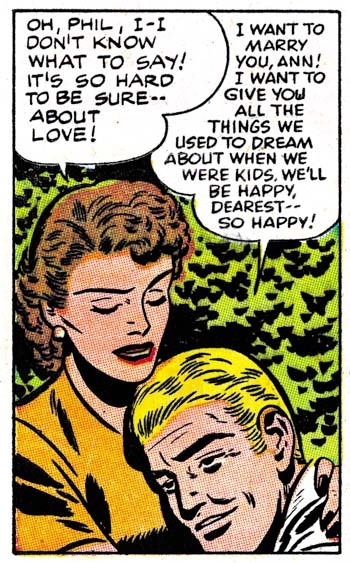 Forearmed with previous examples of Kirby “ghosting” we know to ignore some superficial traits such as the eyebrows. 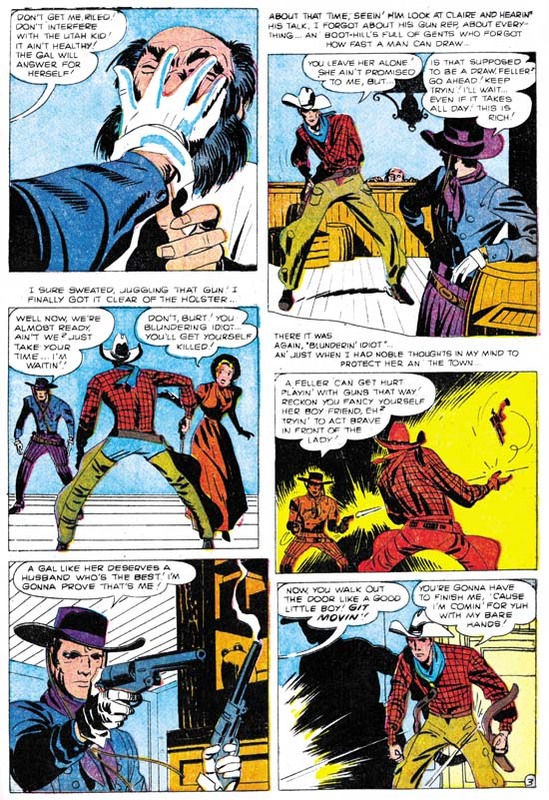 So even with what little we have it looks like Jack was the actual penciler. The Prentice imitation really does not come off that well. Actually the previous Draut imitations were not that close either. Draut’s very stylized eyebrows stand out in his art. Do a good imitation of the eyebrows and other inaccuracies get unnoticed. Prentice, on the other hand, did not have any single outstanding trait. All of his style’s traits must be mastered in order to make a good pseudo-Prentice. 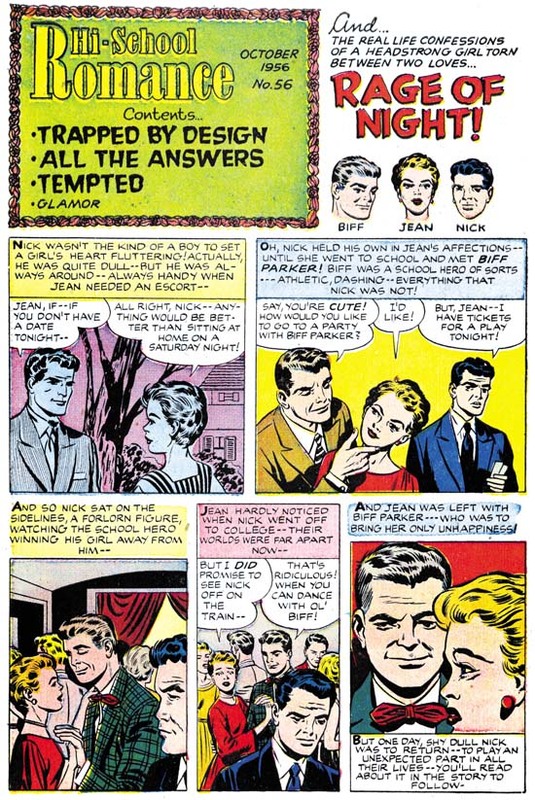 Jack succeeds most in the brother in panel 3, and to a lesser extend the father in panel 2. 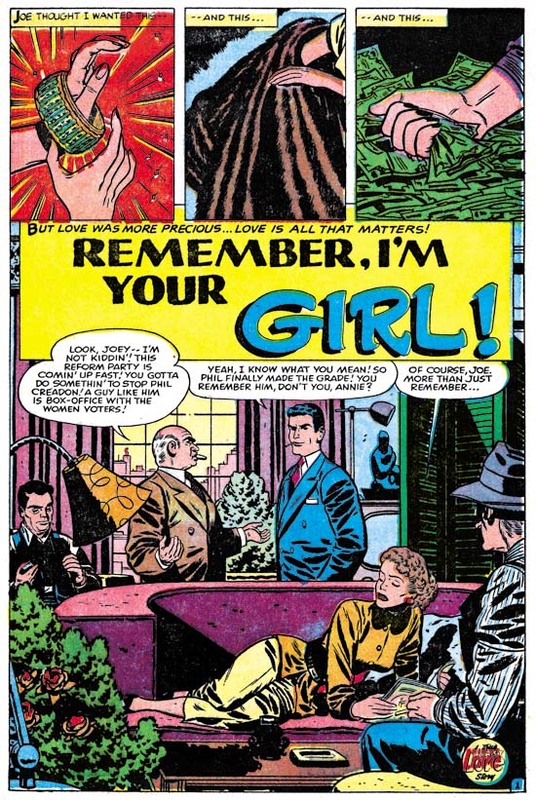 Kirby completely misses with the woman. This best seen in panel 3. Prentice’s females have a sophisticated beauty. This is due in part to the eyes being closer together and the face being longer and more oval. Jack’s version still has the more widely separated eyes and triangular face that he favors. 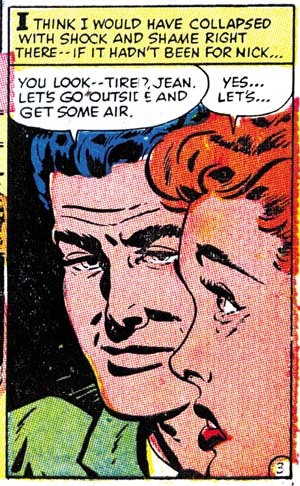 Surprisingly all the eyebrows are closer to Bill Draut’s art then they are to Prentice’s manner. Not all failure to provide a good imitation of Prentice can be laid on Jack. It seems to me that the inker has to take some of the “credit”. In FL #68 and #69 there was not enough of the inking for me to be certain who did it, although it clearly was not Draut. In FL #70 there is more then enough spotting to say that Jack did not do this inking. I am not certain, but some of it looks like Joe Simon’s work. Perhaps someday I should do an analysis of Simon’s spotting techniques. (I can see my readership dropping to even greater depths). Before I leave the topic of the introductory story I would like to add a short comment on its use. Frankly in this case I think this was a really bad idea. A lot of the impact of the actual feature story rests on not providing the reason for the lady’s plight for most of the story. This effect is completely destroyed by the introduction which provides the explanation. This not only ruins the start of the story but makes story’s explanation repetitious. The splash panel of the contents page was clearly not done by Jack. At a glance it would seem to have been done by John Prentice. Since previously we have seen Simon do close copies from the story art I went looking to see if that were true here as well. 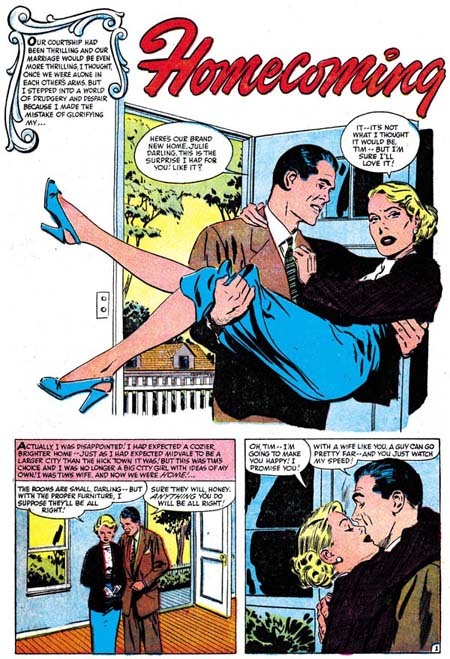 Sure enough the woman is from panel 3 of page 4. In this case the copy is so close that I really cannot see any distinctive Simon traits. There is a significant deviation in the exaggeration done in the lady’s eyebrows, but that cannot be considered characteristic of Simon. Because this sort of copying was previously Joe’s modus operandi for the First Love content page, I am going to attribute this swiping to him as well. Besides some of the inking looks like Joe’s. Posted May 5, 2007 in 2007/05, 7 Freelance, Alternate Takes, Featured Work, Ghosting, Harvey, Kirby Or Not, Periods, Topic, z Archive. A young lady meets a man at a dance and quickly falls in love. Early in the relationship the man tells the woman that he is an Indian. The lady is surprised and then ashamed at her response. She loves him and wants to marry him. On her return home she finds her parents waiting. They have heard from neighbors that her date was an Indian and they insists she stop seeing him. Of course she refuses and the conflict at home continues. The man gives a speech at a bond rally before the entire town. It is revealed that he is a war hero. He gives an impassioned speech about the importance of foreigners in the history of America and the true meaning of freedom. The town is ashamed about their treatment of the man and the couple wed with everyone’s approval. The story of “Forbidden To Love Him” is based in Oklahoma and the chief character is an Indian. Nevertheless it is hard not to a consider this story a more universal condemnation of the racial or ethnic intolerance in much of America during the 50’s. 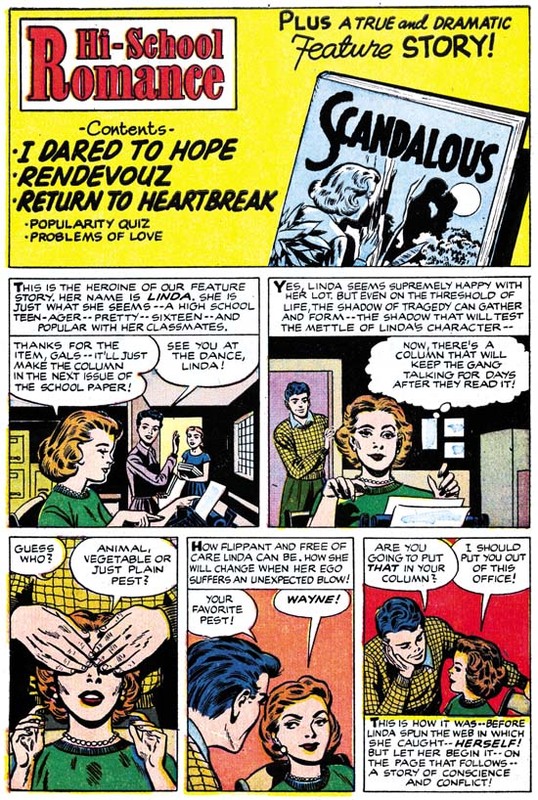 It is a topic that Simon and Kirby had touched on in “Different” (Young Romance #30, February 1951). But their version was much more circumvent and not nearly as bold as this story. 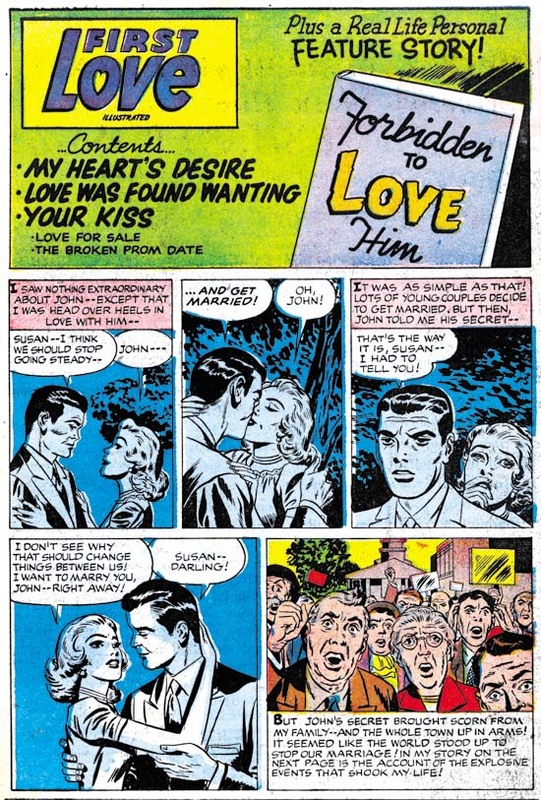 “Forbidden To Love Him” may have been a little heavy handed but it effectively highlighted the hypocrisy involved. 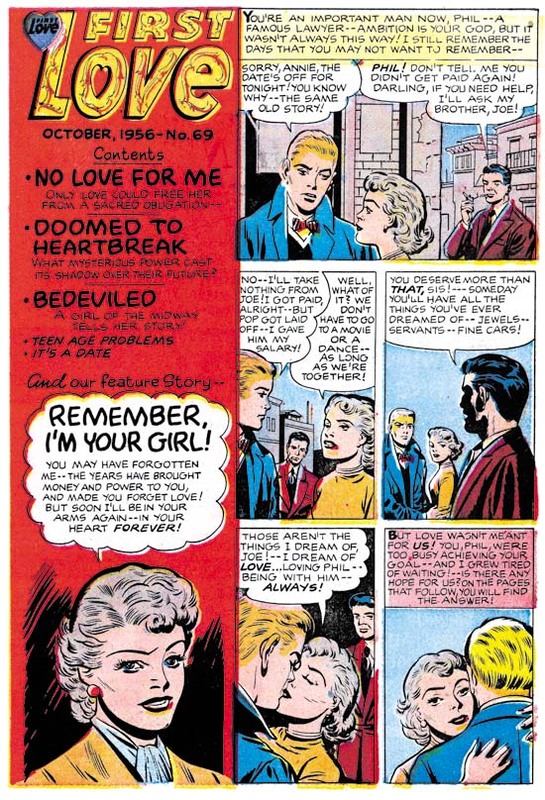 First Love #68 (September 1956) contents page, pencils by Jack Kirby, inks by Jack Kirby? As with FL #69 we have a contents page with an introductory story that at a casual glance could appear to be the work of Bill Draut. In FL #69 the story was a sort of prequel to the feature story. Here in FL #68 it is more like the comic equivalent of a movie trailer. We have less to work with in determining the correct attribution because in four panels all we have are the couple with limited background. Still once you ignore the Draut style eyebrows Kirby characteristics keep popping out. The poses for panels 3 and 4 look particularly like Kirby’s and not the way Draut would have done it. 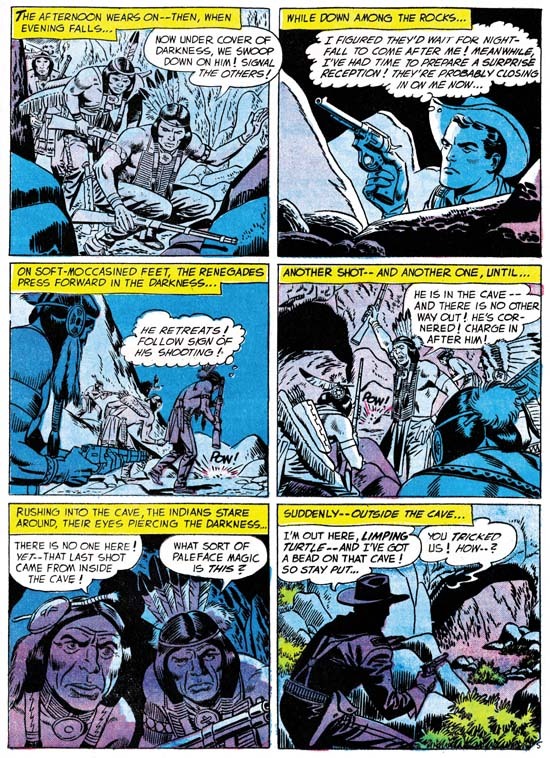 I am discounting Joe Simon’s as the penciller because FL #69 provided examples of both Joe and Jack copying Draut. The art in FL #68 contents page matches Kirby’s version of Draut then it does Simon’s. 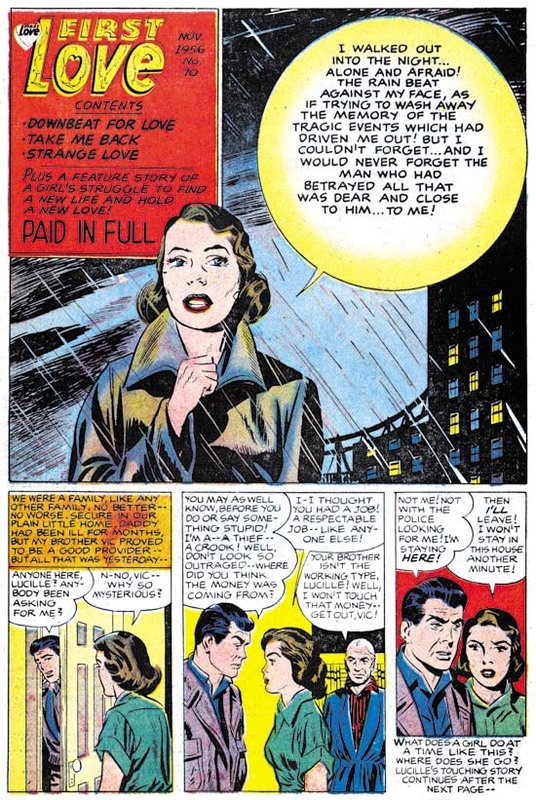 The last panel of the introduction story is more complicated and provides more clues as to Kirby’s involvement. In places Jack seems to forget that he is supposed to be imitating Draut and some faces look like pure Kirby. What is particularly surprising about this panel is that it is a swipe from one that Bill did in the story. 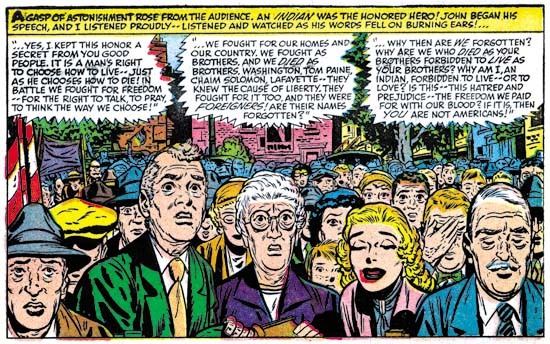 Bill’s original depicted the crowd’s shame as the man revealed his wartime heroism. Jack has converted the scene to town’s anger about the coming marriage. But there is no mistaking the derivation because the lady’s father and mother have the same positions. The bride-to-be herself was left out by Jack because it would not have been appropriate for her to share the town’s anger. It is interesting to compare Bill and Jack’s approach to the crowd. Bill provides more people and arranges them to regularly diminish in size as we go from front to back. Jack draws fewer individuals and we are less aware of the size of the crowd because we cannot see the back. By doing this Kirby is able to provide clearer representation of the emotions for the people he does shows. In the comments to FL #69 Stan Taylor correctly remarked how the architecture looked like Kirby’s. This panel in FL #68 does not provide as many buildings but it still is interesting to compare Jack’s method to how Bill handle’s architecture.